We take care of your motor boat leaving you free to enjoy your adventures at sea. Regular maintenance is paramount for safe boating but very few recreational boaties have the time, knowledge or contacts to carry out regular maintenance checks. They just want to turn up and go. With BoatSmart HQ boat management that’s exactly what you can do. BoatSmart HQ is designed to give you maximum time at sea by letting us take care of the regular maintenance - costing you less in the long term and maintaining your boat’s asset value. What’s more, our unique Vessel Inspection Reports give you a valuable historic service log keeping track of all service history, and providing evidence of all work carried out on your vessel – great for insurance, resale and your peace of mind. At BoatSmart HQ, our goal is to make your boating experiences effortless, convenient and safe. The BoatSmart HQ way is to provide you with quality of service, backed by easy and convenient business processes that will give everything you need to be confident and safe while enjoying your time on the water. Through a range of vessel services, BoatSmart’s unique mobile app and regular First Mate inspections, you are paired with an experienced industry person. He or she will become the go-to guy for your boat and will treat it as if it were their own - saving you time and money and keeping you fully informed and confident of your vessel’s operational status at all times. Scott is a classic Kiwi who has grown up in and around the water. Following a 3-decade career in the tech sector, including senior executive levels in both mobile and smartphone development, creating the BoatSmart HQ app seemed a logical step. Scott's passion is to deliver services that benefit boaties across the globe. Zach has many years’ experience in the marine industry, working as an Engineer and First Mate on Superyachts. In more recent years, Zach has been involved in technology-led businesses engaging with the clients and ensuring customer satisfaction. When not doing that, Zach enjoys fishing, surfing, sailing and trail riding. Nick has enjoyed a lengthy career within the telecommunications industry, including GM Sales for Spark and CEO for Leading Edge Communications. He founded The Sales Factory, supplying outsourced Sales Directors into ambitious NZ businesses, and holds several board appointments in the technology sector. An avid lover of all things aquatic, Nick loves to dive, sail, fish and surf as much as he can. Jeff is an investor in Intellectual Property. UK-based, he’s enjoyed an international career at board level with Sony Europe and BBC Worldwide, before establishing his own brand consultancy. 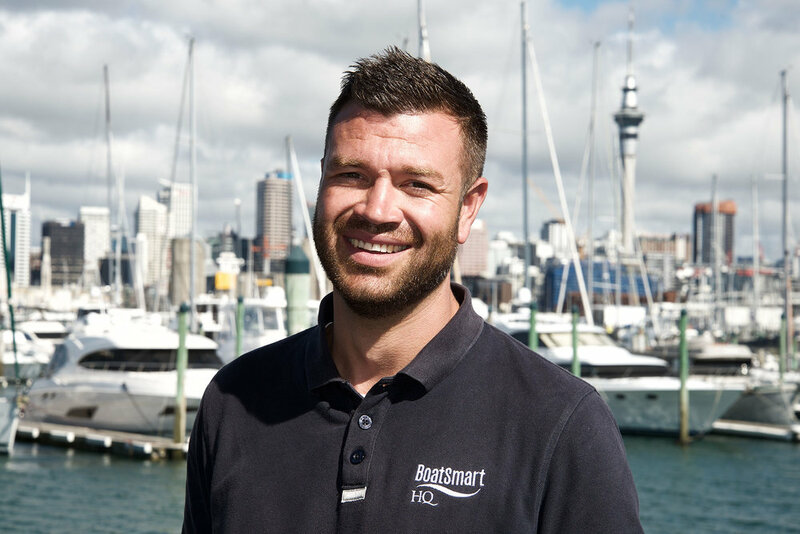 With a launch in Auckland, he was looking for a managed maintenance solution, which has led to the development of BoatSmart HQ. If you’re passionate about boating, an industry person and know your way around a vessel, then BoatSmart HQ’s First Mate service could be just what you’re looking for. At BoatSmart, our First Mates are paired with our members’ vessels in your local marina and the First Mate becomes the go-to guy for that boat. We provide a comprehensive monthly on-board vessel inspection service for members. All operational aspects of the boat are audited and checked-off using a simple mobile app that customers have on their smartphone, PC or tablet. Vessel Inspection Reports are then sent to the owner via the app so that they know the full operational status of their vessel at any time. You can work at your own place and your own pace, and manage our members’ boats as if they were your own. Full training, use of the app and a clothing package will be supplied to all First Mates. NB: Security vetting and an independent insurance policy are required. So join BoatSmart HQ today as a First Mate and get paid for doing what you love to do. Send your CV together with a covering letter to zach@boatsmarthq.com. We will endeavour to reply within a reasonable time and look forward to welcoming successful candidates aboard.